“Pinky,” the only known albino adult bottle-nosed dolphin is colored a Pepto Bismal-shade of pink. When I was around five years old my late father, Chester Moore, Sr., had his own mysterious aquatic encounter. While fishing with a friend on Conway Bayou on the Louisiana side of the Sabine River, a gigantic gray-colored creature surfaced next to their aluminum boat and inspired them to head home. He immediately called a local game warden and was shocked to find out a manatee had been seen in that very location a few days earlier. This was in the days before multiple television networks dedicated to animals and, of course, no Internet so this sighting came as a shock to the system. Manatees have a body form similar to a seal, but they are much larger, reaching 13 feet in length. Manatees can live to be 50 years old. 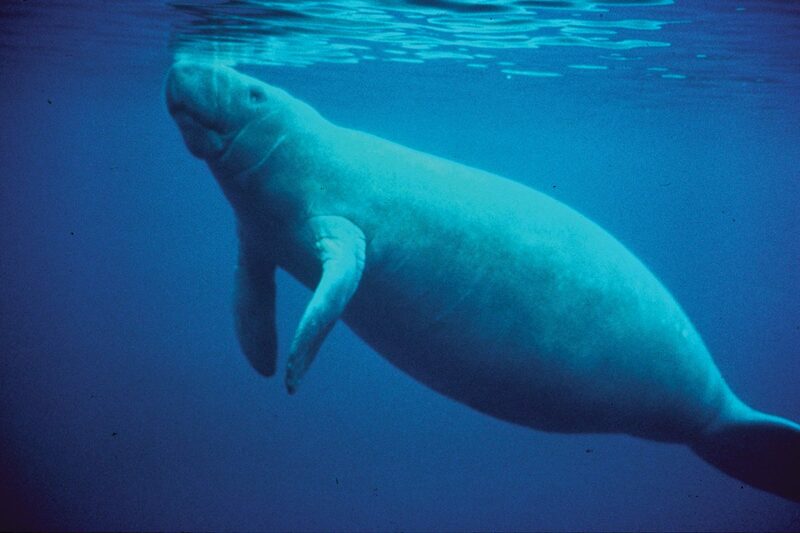 The average manatee is 10 feet long and weighs roughly 1,000 pounds. Females are usually larger than males. Manatees have been spotted as far down the Texas Coast as Port Mansfield. According to LSU officials, manatees spend six to eight hours a day in shallow water grazing grass beds consuming roughly 100 pounds of food each day which equals four to nine percent of body weight. My wife Lisa and I have snorkeled with manatees on two occasions in Florida’s Crystal River and were amazed at how friendly these giants can be. It was sad to see the prop scars lining their back,but it’s interesting to know Florida is the epicenter of the U.S. population. Some individuals travel up and down the Intracoastal Waterway and end up in Texas and Louisiana. A few years back my friend Bill Killian and I were fishing on a super-hot and perfectly calm day at one of the nearshore gas platforms out of Sabine Pass. High barometric pressure gave the fish a good case of lockjaw but things did not stay dull for long. A huge head surfaced out past the rig. At first it looked like images of the Loch Ness Monster or some other sea serpent but then a distinctive tear drop-shaped body rose and revealed a leatherback sea turtle. This was not just any leatherback, but a huge specimen that was at least seven feet long, perhaps larger. These are not common sights on the Texas coast, particularly only three miles from shore. It swam around for a couple of minutes and then dove back under never to be seen again by Killian and me. Turtles can live for incredibly long periods and I cannot help but wonder what that great creature had seen over the years. How many boat hulls had it swum under? How many brushes with tiger and bull sharks did it have through the years? Occasionally a tarpon will show up in strange places like the north end of Sabine Lake. I saw one in Old Rove destroying a school of mullet one hot August day in 1996, and we did a story somewhere around 2001 about an angler who caught a six-footer on the Louisiana side of the Sabine Jetties. Although not a truly unusual catch, many anglers are surprised to catch big jack crevalles in places like the San Bernard River.Some of those anglers had never seen this fish before. They are caught more frequently in the surf and at the jetties. Every couple of years someone will call and tell me they caught a “yellowfin tuna” somewhere in Trinity Bay, and I have to break it to them that it’s not a tuna, but a jack crevalle. They have similar coloration and are roughly the same shape. Luckily, for the anglers most of them either released the fish or called me before they ate it. Yellowfin is one of the tastiest fish in the world and jack is one of the oiliest and nastiest. Texas is blessed with hundreds of miles of coastline and thousands of miles of rivers as well as hundreds of reservoirs. There are still mysteries to uncover below the surface. The children of our Kingdom Zoo project have started a project gathering sightings reports of “Pinky” the dolphin, manatees in Texas and Louisiana as well as large sharks. If you have any such photos, email them to [email protected]me.com.